You know how some people are really addicted to cocaine? The actor James Woods is just like that, only instead of being addicted to cocaine he’s addicted to Twitter. Woods swore off the service back in November, claiming that he was finished with Twitter and all its censorship of alt-right voices. But much like the way that people who swear off cocaine might become addicted to the thrill of the drug and start using again, Woods came back to it—Twitter, that is. He came back to Twitter. Incidentally, back in 2015, an anonymous Twitter user with very few followers called Woods a “cocaine addict.” This so enraged Woods that he filed a $10 million defamation suit. The man died of unknown causes before the case could be brought to trial, but we learned this week that Woods hasn’t given up the suit. He wants the anonymous Twitter user exposed, despite the fact that he’s dead. The lawyer for the now-dead Twitter user, Kenneth White, filed a motion seeking that the case be thrown out and opposing the order to reveal the user’s identity. In the spirit of the alt-right, Woods is a fan of calling people “snowflakes” to imply that they aren’t tough enough for the harsh realities of the world. In fact, according to a reply filed by Woods’ attorney, all these snowflakes need to be taught a lesson that they can’t hide behind anonymity—even after they’re dead. To be fair, the tweets from Woods did not mention that he would follow the Twitter user’s family to the bowels of Hell. With regard to the fact that Woods hoped the man “died screaming his name,” I guess one would have to assume that the man died outside the immediate vicinity of his family. We don’t know for sure, though. This entire saga might seem like a ridiculous joke perpetrated by clown-boy scum, but this reporter can assure you that it’s all very real. According to the statement from Woods’ lawyer, it wasn’t just being called a cocaine addict that was harmful to his reputation. In fact, the now-dead meanie started it all. Since rejoining Twitter after his month-long hiatus, Woods has commented briefly on the latest developments in his case, posting screenshots about his continued pursuit of the dead man’s identity with hashtags like #YouCanRunButYouCannotHide. In his time back, Woods has also responded to some Twitter users with variations of “your mom” jokes; proclaimed that “our gene pool is slowly breeding out abortion lovers by virtue of the very self-limiting evolutionary strategy it is” accompanied by a photo of unnamed abortion rights advocates; and most recently, Woods posted a photo of President Obama with the word “antisemite” scrawled across his forehead. I speculated in my last post about James Woods that it would be tough for the actor, perhaps best known as winner of the “Role Model Award” during the Young Hollywood Awards ceremony in the year 2000, to quit the service for good. It’s too addictive. Much like cocaine. 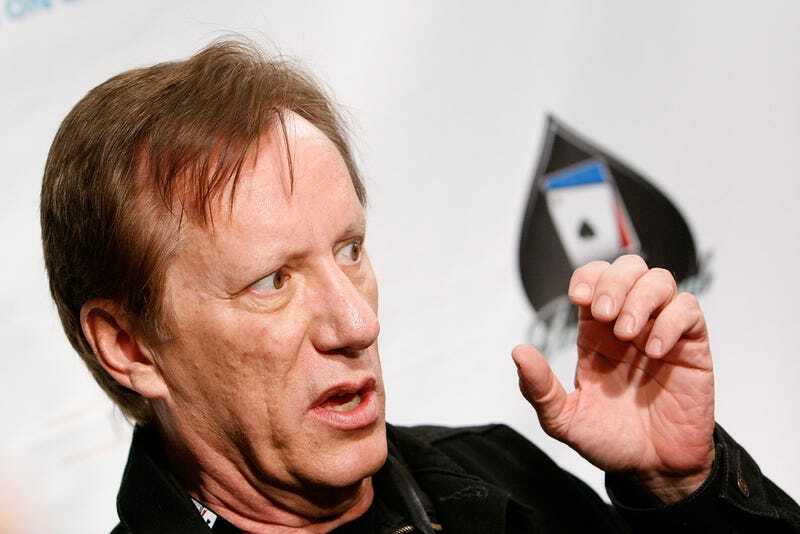 A substance to which James Woods is emphatically not addicted, according to court filings.